Activision's remake of the classic shooter on the Nintendo 64 is updated for the Wii and it brought back memories of trash talking in college dorm rooms. It's 1997 and the Nintendo 64 has already had a couple of breakout hits like Mario 64. When Rare came out with Goldeneye, many were quick to dismiss it as a cheap movie tie-in of the James Bond film with the same name, but that couldn't be further from the truth. Goldeneye was a great shooter, and millions of people played hours of split screen mayhem from the frenetic Slappers Only to one-shot License to Kill in the Complex. The singleplayer wasn't too bad either, with passable representations of Pierce Brosnan and Sean Bean duking it out in a story that followed the film closely. In talking to James Lodato, Associate Producer at Activision for the Wii remake, it's clear that the devs approached the project with the same love and admiration that I felt for the game. "The original game was really genre-defining," Lodato told me at New York Comic Con. "It brought multiplayer shooters to the console." Lodato pointed to the four fans demoing the game in the busy Javits Center. "That's exactly what we did. Four people on a couch, playing on a splitscreen, nudging each other like this. It was a real social experience." We swapped war stories of fighting for the best controller (hopefully one that didn't rattle when you shook it) and dealing with the tangled cables. "With such a monumental title, it was really important that we stay very authentic to the Goldeneye feel," Lodato said. Despite that, the decision was made to update the game for today's James Bond and modern gamers. Daniel Craig has a much different voice and physicality than Pierce Brosnan did in the movie Goldeneye and Lodato said they were careful to represent that with his voice-acting and motion capture. Judi Dench makes a return as M but unfortunately, Sean Bean couldn't reprise his role as the villain. "In order to update the story properly, we employed Bruce Bierstein, who wrote the screenplay for Goldeneye the movie," Lodato said. "He came onsite with us and updated his own script. He sat down with us an updated the dialogue and some of the locations. You can't get more authentic than that." Sitting down on the couch to play Goldeneye, I had a premonition that it wasn't going live up to my memories of the original. I do have to say that one big drawback was the controller. Playing with Nintendo's updated "classic" controller for the Wii just didn't feel the same as the actually classic N64 controller. I picked the same character that I always did back in the day, the assassin Xenia Onatopp, but I just couldn't get into the groove and got killed several times by the Golden Gun. I think the problem was that I picked a sniper rifle loadout and didn't have the same firepower that I was used to. Wait, what? Loadouts? This definitely isn't the Goldeneye that I remember. 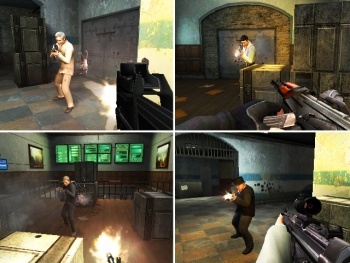 All of the old characters that you could play with return like Oddjob (Cheater!) or Jaws, but Activision has also added over 50 other characters that you can choose to play as in multiplayer matches. There's tons of new weapons and tricky grenades, but the old weapons are also there, like the Klobb. Damn, I hated that gun, but thankfully, the Klobb doesn't end up on seemingly every map; Lodato said that it's a little hidden in this game. Another addition is online multiplayer. You still have to use Friend Codes ("We weren't going to change Nintendo's mind on that one.") but Lodato assures me that it is seamless. You can play with up to 8 people online and share and track stats. "You can now play Goldeneye with someone in another state, whereas before you had to be on the same couch. " All of what I heard sounded great, but my experience playing Goldeneye was a series of contradictions. It's similar to the old game but not. It's authentic but also updated. It's Classic but Modern. All at the same time. I'll pass judgment when I play it live, and get the old crew from my dorm room back together, but it's possible that Activision may be trying to put lips on a duck. Some old classics deserve to be kept that way.